SEAT is showcasing the stunning IBZ Concept at the 2009 Frankfurt Motor Show. 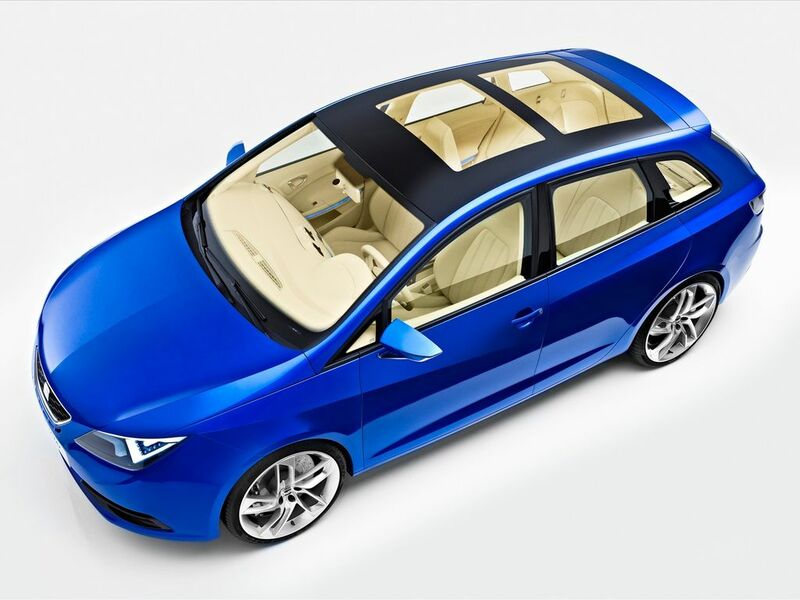 The star of the SEAT stand in Germany previews a new, family-sized version of the Ibiza that will make its debut in showrooms across Europe towards the middle of next year. Boasting a modern, tensioned silhouette, the concept car making its world debut at the IAA includes numerous distinctive exterior and interior design features, and benefits from cutting-edge technology for a gripping driving experience. Once again, SEAT Design Director Luc Donckerwolke has applied his pragmatic vision to create an attractive yet functional car where comfort and roominess complement the traditional sports philosophy common to all SEATs. The world debut of the bold IBZ Concept is another significant step on the company's path to extending its range line-up. The challenge it meets is to combine a larger, family-sized chassis featuring greater load capacity with the distinct, feisty personality of the Ibiza . The nose of the concept car shows an elegant evolution of SEAT's now trademark Arrow Design. The bonnet features a new ‘running edge', splitting the car through its longitudinal axis, adding precision and sharpness to the familiar Ibiza face. Taut ‘eyebrows' accentuate the headlights, whose diamond-shaped interior combines LED technology with light guides. The new centre grille, with honeycomb slats and aluminium surround, is underlined by the same purist, rectangular air vents found on the Ibiza Cupra. Another development at the front sees the usual arrow shape enhanced by a set of lines parallel to the headlights, finishing at the broad opening beneath the bumper. Two aluminium mouldings in this area round off the front end design. Very clearly styled to stand out, the IBZ Concept boasts an attractive sweep created by the newly-designed headlights, complete with LED technology. Their pointed tips provide continuity to the Dynamic Line that brushes over the wings and the middle of the front doors, while their novel interior structure mimics the facets of a diamond. One set generates the main beam, while the smaller LEDs generate the dipped beam. At the same time, a portion of the smaller facets at the top of the cluster serve as daytime driving lights, with the indicator LEDs at the bottom. 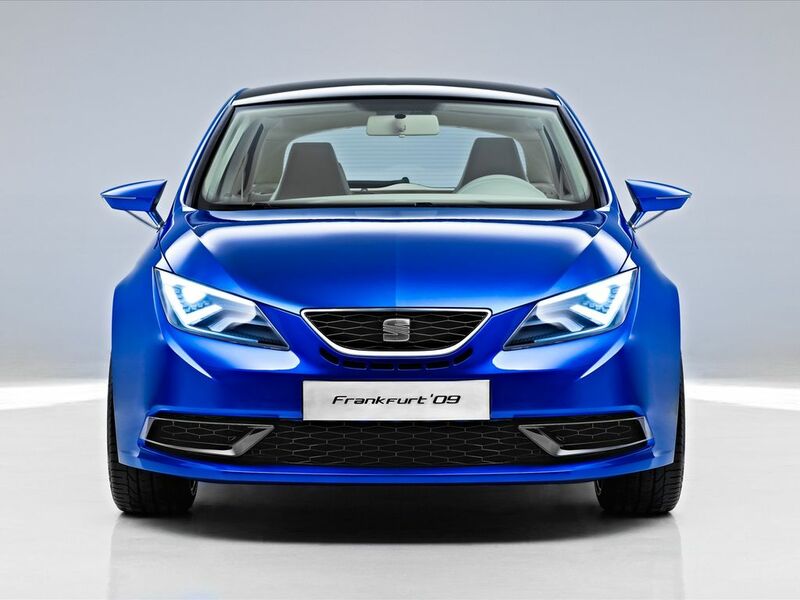 The exterior design of SEAT's prototype is enhanced by its high gloss, eye-catching blue paint colour while a broad panoramic sunroof floods the interior with light. The LED indicator lights literally stand out, as they are built into the new streamlined door mirrors – each one mounted onto its door with a pair of arms. The exterior arm which supports the mirror, and the mirror's outer casing are both aluminium to match the other trim elements found on the car. A side view reveals low profile 235/35 tyres on attractive, five double-spoke 19-inch alloy wheels, each with an embossed ‘S' at the hub. Another tell-tale SEAT feature of the IBZ Concept are the Leon-inspired rear passenger door handles, which are neatly integrated into the third side windows. The attention-grabbing new hatch naturally bears the SEAT logo and when the rear hatch is open, its structure has a very low load floor that sits flush with the number plate. Meanwhile, the broad rear window provides great visibility. An elegant, high-mount roof spoiler houses the third brake light – underlining the car's sporting intent. As usual, the SEAT logo doubles as the boot handle mechanism and the prototype is easily identified by the ‘IBZ' initials beneath the logo in the centre of the hatch. The crisp rear section of the IBZ Concept is further enhanced by the addition of defined ‘shoulders' that house the light clusters. As with the striking headlights, they feature LED technology on a raised surface. From bottom to top, the LEDs create the sidelights, brake, reverse and indicator lights. The final highlights rounding off the view of the rear are a new bumper, which has a built-in number plate, a number plate light at the bottom of the hatch and split twin tailpipes, which each boast a stylish aluminium bezel. The passenger compartment of the SEAT Ibiza IBZ Concept offers space and style in equal measure, with fine detailing and functional innovations throughout. The interior is structured by ‘light guide' strips that run through the dashboard and the doors, integrating the radio/iPhone interface screen and providing atmospheric lighting at the same time. The light, airy tones of the cream coloured ‘Magnolia' interior heighten the feeling of space inside this SEAT. The dashboard features the same colour, and a different texture is provided via the suede-clad soft pads. The instrument binnacle hood, door panels, pillars and ceiling are also finished in suede. The newly-designed seats and integrated headrests are upholstered with a combination of leather and suede in the same colour as the dashboard, with blue stitching to match the body colour. In trademark sporty SEAT style, the steering wheel on the IBZ Concept is slightly flattened at the base. It is wrapped in leather and suede and has a four-spoke structure with dipped side grips, the SEAT ‘S' in the centre and the letters ‘IBZ' on the lower spoke, and a set of newly designed multi-functional controls on either side. Naturally, the sporty design of the instrument panel is faithful to the brand's identity. The large dial on the left is the rev counter, with a screen taking up the rest of the space. On the right is an analogue and digital speed display, with the navigation information, trip computer and remaining vehicle controls shown in the middle. There are four circular air vents on the dashboard encased in aluminium. A special interior design concept features a striking combination of aluminium layered with a glossy black material that make up a line with recessed lighting extending across the dashboard and continuing onto the door panels. The centre houses a screen displaying radio and iPhone functions, and the centre console has a purpose-built iPhone slot. The centre console also features a stylish climate control system with all the usual functions; the gear stick with a leather gaiter and a panel with buttons to activate the hazard lights, door locks and seat heaters, as well as several storage compartments. Close by is an electronic hand-brake and the central armrest, which is cloth upholstered with a handy storage compartment that can also be removed from the vehicle. The newly designed door panels on the IBZ Concept echo the style of the dashboard, with the soft pad in suede and an aluminium insert beneath the armrest. The aluminium door handles and speaker frames are also new – the latter with a unique arrangement of square slats. Predictably perhaps, beneath the rear hatch of the new SEAT Ibiza IBZ Concept lies a spacious boot. Measuring an impressive 410 litres, it can be significantly extended when the rear seats are folded to leave a completely flat cargo space that stretches right to the back of the front seats. The boot's low load height makes it easy to access, allowing heavy or bulky items to be loaded more simply. It also provides several solutions for keeping objects securely in place such as side hooks or storage nets on either side of the wheel arches. There's also a supplementary storage compartment beneath the folding boot floor. A cover leads to the spare wheel and tool box. The detailing in the boot once again shows SEAT's quality workmanship in practice. The edges of the floor covering are finished with leather, and the soft pads on the side are in cream-coloured suede. 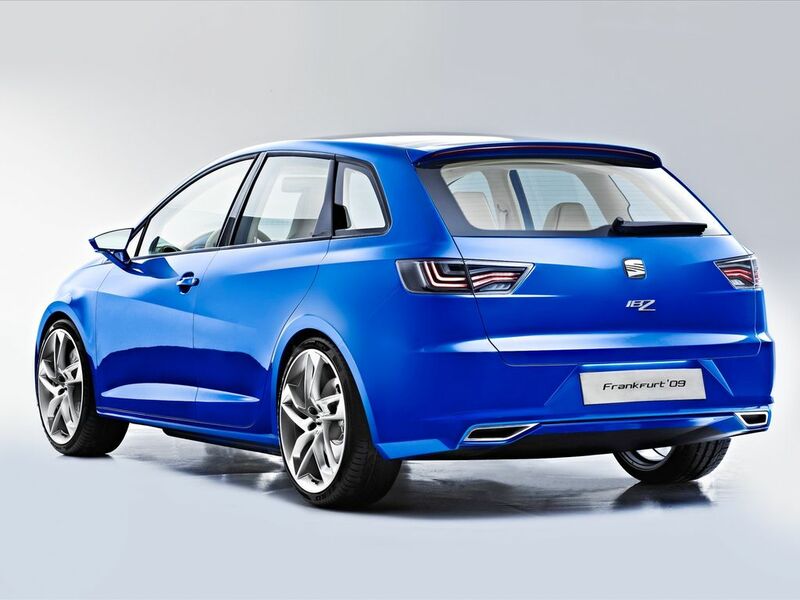 With the unveiling of the stylish Ibiza Concept IBZ at Frankfurt Motor Show, SEAT is offering a preview of the future family-sized version of its most popular model. The production version is expected to arrive in showrooms across Europe next year as the company continues its new product offensive which is making the Spanish brand's range the youngest on the market. In the year of the Ibiza 's 25th anniversary, the newest addition to the range underlines the car's segment-leading quality, design and workmanship. The chassis of the new IBZ Concept has the same compact dimensions as an Ibiza hatch, with a total length of 4.22 metres and the same height and width. However, access to the rear seats is improved still further via broader rear doors. As with the rest of the SEAT range the sporty, design-driven youthful style of the new Ibiza IBZ Concept make it perfect for those who value space, practicality, comfort and driving enjoyment.